With the 10th anniversary of the 9/11 terror attacks approaching, several images that have haunted the nation for a decade have begun to reappear in the media. 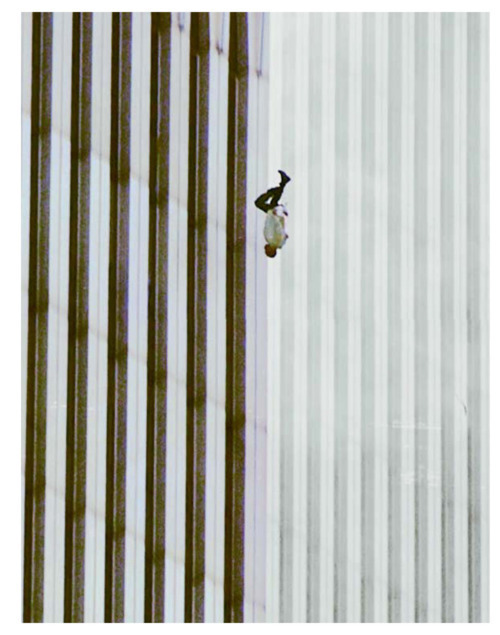 One of the most haunting images from the day is that of “The Falling Man" - a photo with a story behind it, and a photo that sparked a story in itself. "The Falling Man" was taken Richard Drew of the Associated Press. The photo shows an unidentified man falling from the North Tower of the World Trade Center just after 9:40 a.m. - just under an hour after a hijacked plane struck the tower, and approximately 48 minutes before the building’s collapse. When the jet struck the North Tower, a number of individuals, including the photo subject, were stranded on the floors above the impact zone. With no escape route, as many as 200 people leapt from the building rather than succumb to the fire, smoke and the eventual collapse. As a side note, the New York City medical examiner’s office has stated that it doesn’t classify these deaths as suicides, because they did not arrive at work that day with the intention of dying - they were forced out. Officially, all of the deaths on 9/11, except for those of the hijackers, were ruled homicides. On the morning of the attacks, Drew was shooting a fashion show in New York’s Bryant Park when word reached him that the North Tower had been struck by a plane. He took the subway downtown, and when he arrived, began shooting photos. He stayed until both towers had collapsed - after which, with the city’s public transportation system in chaos, he walked back to his office in Rockefeller Center. Drew had about a dozen frames of The Falling Man - but said one particular image leapt out at him because of the symmetry. The subject is vertical in midair, directly centered before the background of the towers. In the other frames in the sequence, the man is twisting and turning in midair before he eventually drops out of the frame. The photo appeared on page 7 of the New York Times on Sept. 12, as well as in other publications around the country, on Sept. 12. The photo has attracted criticism from some viewers who find the image disturbing, or those who feel it’s an invasion of privacy. Several efforts were made to identify The Falling Man, with investigators looking at the man’s clothing, the employment records of the businesses in the floors above the impact zone, and questioning families. However, the identity of The Falling Man has never been conclusively established. The search for his identity was the subject of a 2006 documentary, “9/11: The Falling Man." A story about Drew’s photo and the quest for the subject’s name was also featured in Esquire. Several sociologists have speculated that The Falling Man’s anonymity has made him a touchstone for the nation to mourn at collectively - similar to The Tomb of the Unknown Soldier. Drew, an Associated Press photographer for over four decades, lives in New York with his family. Even before 9/11, he had gained notoriety as one of just four press photographers present at the assassination of Robert F. Kennedy.